3 nights on Chincoteague Island – $100 per room, per night! Give yourself a break: 3 nights on Chincoteague Island! You’ve made it through the summer and now it’s time to take a well deserved breather – it’s time to relax! – and we have just the deal for you! Stay 3 nights on Chincoteague Island during the week (Monday through Thursday) in one of the best rooms we have available, enjoy a gourmet breakfast every morning, access to snacks 24/7, bikes and beach gear for your use, and all for only $100 per room, per night! That’s right: you can experience the historic, 1848 Island Manor House Bed and Breakfast right here in the charming community of Chincoteague for only $100 a night. Posted in Island Manor Specials & Packages | Comments Off on 3 nights on Chincoteague Island – $100 per room, per night! Views from the top of Assateague Lighthouse are lovely. Chincoteague and Assateague Islands are relatively flat, which makes them great for biking and walking. Beauty is everywhere: in the long stretches of beach, the marshes, and the bays. The village has many historic buildings, such as the 1848 Island Manor House, our Chincoteague Bed and Breakfast. Even walking down Main Street is an aesthetically pleasing experience. Still, some people crave big views. The best spot for these folks is the Assateague Lighthouse. Part of Assateague Island lies in Maryland, and part in Virginia. The lighthouse is located on the south side of the island in Virginia, close to the bridge from Chincoteague. Indeed, it’s less than three miles from our Chincoteague Bed and Breakfast to the Assateague Lighthouse trail. Many guests bike out to the lighthouse; we provide bikes if guests don’t have their own. 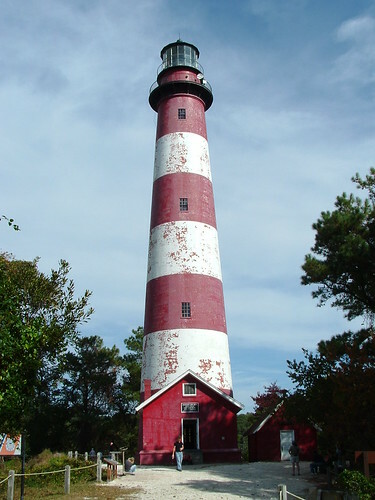 The present Assateague Lighthouse was built in 1867, replacing a shorter, inadequate tower dating from 1833. The brick structure stands 142 feet tall on top of a 20+ foot bluff. It is one of fewer than 20 lighthouses of its kind still functioning on the Eastern Seaboard today, and is easily recognizable to mariners thanks to it’s broad red and white stripes and nightly flash pattern. Visitors will notice that the Assateague Lighthouse is not located right on the shore of the island, but nearly five miles inland. It was not always so. The tides have shifted the sands and somewhat stranded the light, though it’s light still warns shipping traffic of the shallow waters off Assateague. Visitors are welcome to climb to the top of the lighthouse. Those who do are rewarded with expansive views. Ask the innkeeper of our Chincoteague Bed and Breakfast about lighthouse tours. The light is open seven days a week from June through September, and Fridays through Sundays October through May. From time to time, reparations may alter this schedule. Up-to-date information is available at 757.336.3696.